Up to five times more thermally efficient than a standard steel lintel, Hi-therm+ provides architects and house builders with a low cost route to improve CO2 reduction and Fabric Energy Efficiency standards. 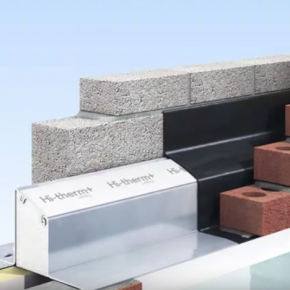 The Hi-therm+ lintel offers the simplicity of a one piece, structurally superior top hat design creating stability during the building process and making it faster and easier to install, compared a two part lintel solution. The Hi-therm Lintel is the only BBA Approved one piece lintel solution which achieves the appendix R value for steel lintels in Part L 2013. Keystone Lintels worked closely with the BBA throughout the development of Hi-therm+ to guarantee customers were offered an innovative solution, which meets the highest quality and safety standards. The innovative design of the Hi-therm+ lintel has resulted in multiple award wins, including Best Building Fabric Product at the Housebuilder Product Awards 2018 and Construction Product of the Year at the Irish Construction Industry Awards 2018.